ERIE, Pa. — Robert Morris and Mercyhurst finished their 2017-18 season series at the Mercyhurst Ice Center, with the Lakers winning 3-2 in overtime. The Lakers honored their 11 seniors before the game- Bryan Sienerth, Jack Riley, Jonathan Charbonneau, Kane Elliot, Michael Verboom, Nathan Ferriero, Brandon Wildung, Tyler Enns, Patrick Piacentini, Zach Todd, and Brandon Gotkin. After a scoreless first where the Colonials outshot the Lakers 15-6, the Lakers found the net first with senior Patrick Piacentini. Piacentini’s marker later was answered by Luke Lynch on a phenomenal shot. The Lakers regained their lead when Kane Elliot slipped a puck behind Andrew Pikul early in the third, only for the frame to be bookended with a goal from one of the Colonials seniors, Robert Powers. 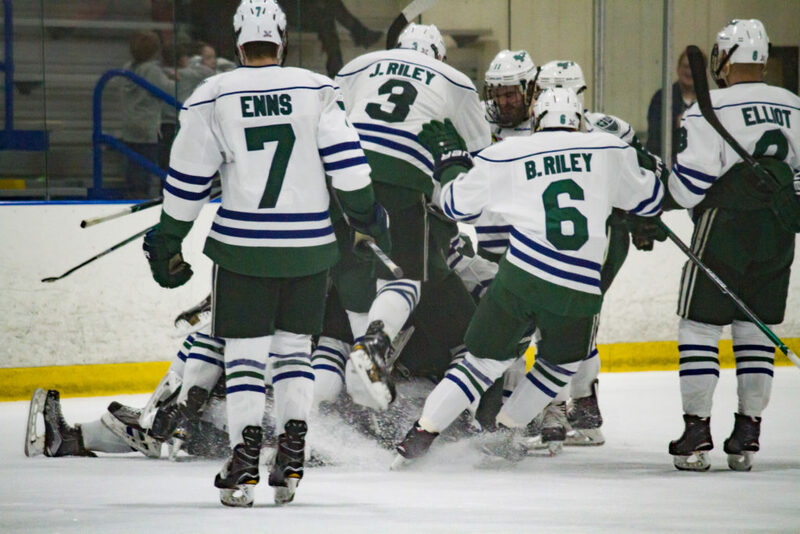 15 seconds left in the overtime, Joshua Lammon of Mercyhurst found the net, allowing the Lakers to sweep the weekend series with the 3-2 overtime win. Robert Morris outshot Mercyhurst 39-26 on the day. The Colonials will finish up their regular season with a home series against Air Force, and celebrates the class of 2018 on Saturday, February 24 at 7:05 p.m at the Island Sports Center. Mercyhurst, who takes over first place in Atlantic Hockey with the win, heads to Rochester for a two game series with the Tigers. Andrew Pikul in net for the Colonials. Taylor Best gets tripped by Elias Ghantous. Nate Ferriero gets pinned to the wall by Sean Giles. Rob Powers holds Joey Duszak down during the first. Rob Powers holds downJosh Lammon. Elias Ghantous falls int Zach Todd during the second. Les Lancaster trips Timmy Moore in front of the net during the second. Brandon Wildung watches the puck in the second. Rob Powers watches the puck during the third. Spencer Dorowicz knocks down Jack Riley in front of Andrew Pikul. Nick Jenny hits Tommaso Bucci during the third. Mercyhurst wins in overtime 3-2. Seniors meet at center ice for a post game prayer.